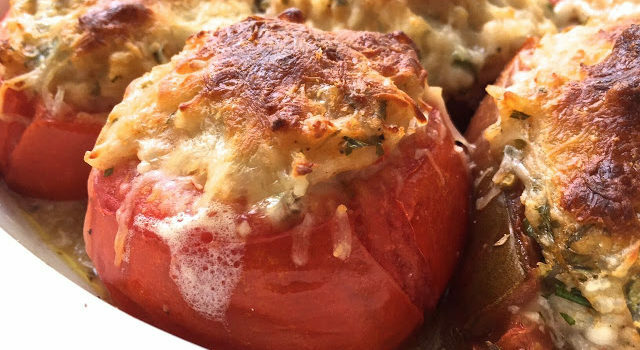 Wondering what to do with all those luscious tomatoes ripening in your garden right now? There are only so many tomato salads one can eat in a day. After making bruschetta, pizza, gazpacho and tomato sauce (and popping a few tomatoes whole into plastic bags for the freezer), I needed another idea. Thankfully, I found it on Domenica Marchetti’s blog, Domenica Cooks. 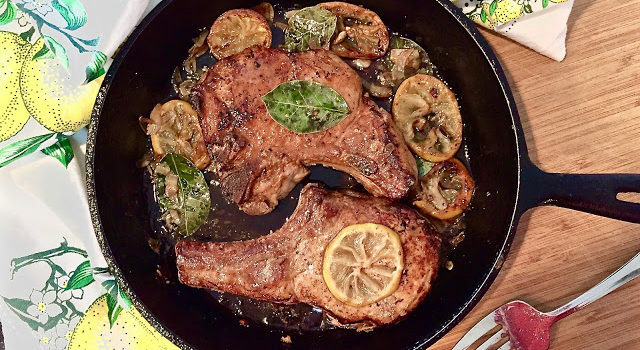 As soon as she posted this classic Roman recipe, it struck a note of nostalgia and hit one degree of separation. My late friend Clo, who was a native of Rome, (and who was also friends with Domenica’s mom) used to make these each summer. Although I’ve made tomatoes stuffed with quinoa, it was time for me to follow Domenica’s lead (and bring back memories of Clo) and stuff tomatoes with rice. 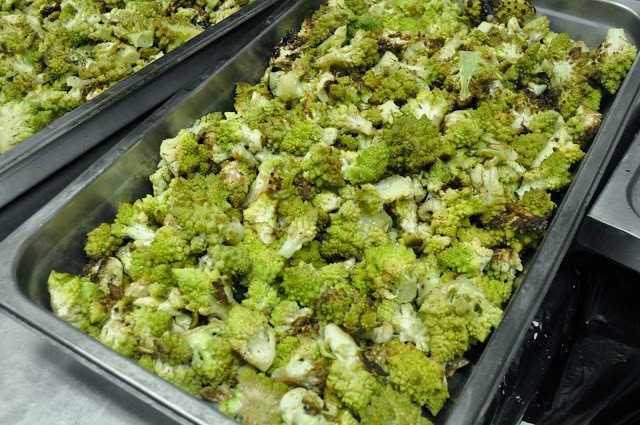 They are delicious hot, warm, lukewarm or cold – perfect to take on a picnic or a lunchbox. Start by hollowing out the tomatoes – cut a rim with a small paring knife around the circumference of the tomato. Scoop out the pulp with a spoon. 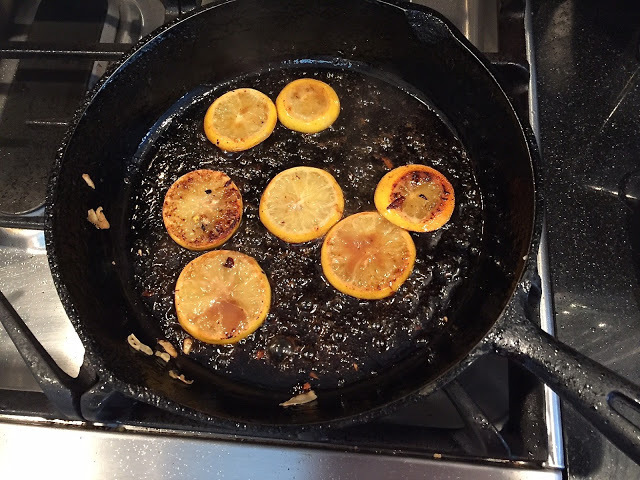 Place the pulp into a colander and press out the juices as much as possible (or until you get tired). 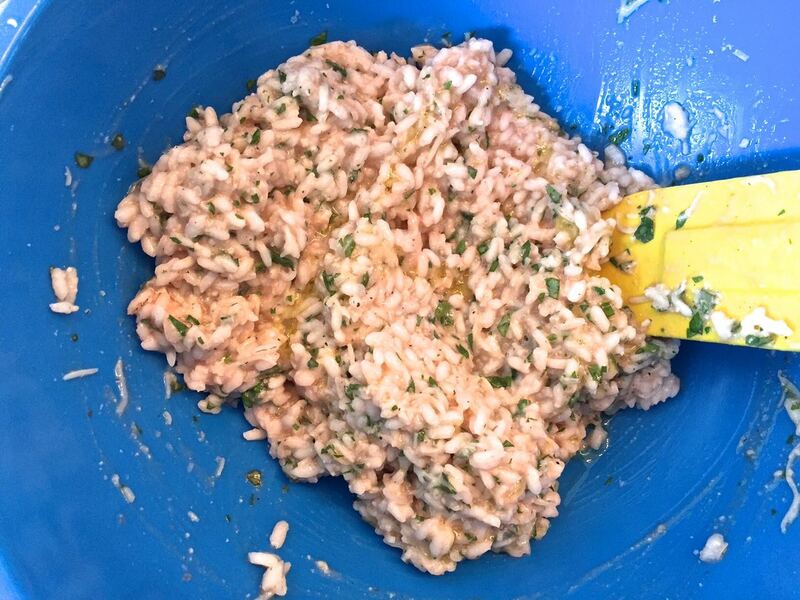 Pour those juices into the cooked rice and mix with the herbs and cheeses. 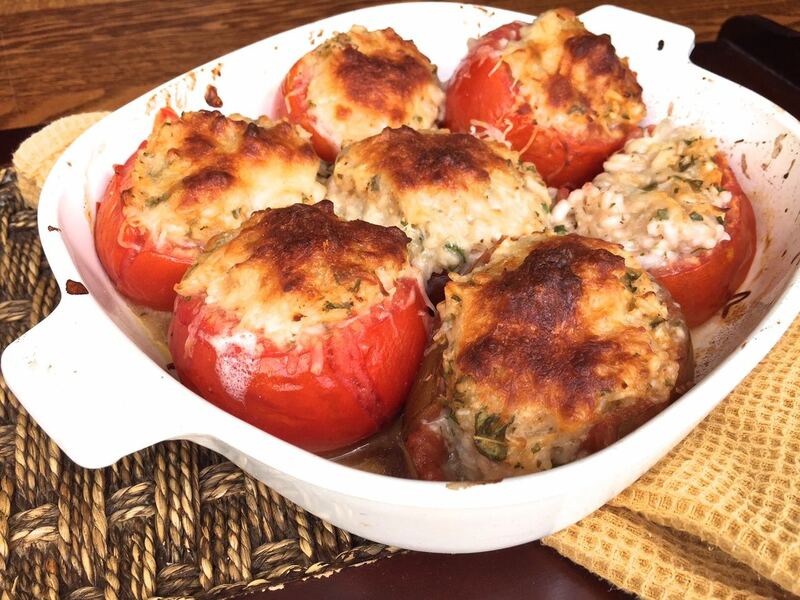 Place a little oil on the bottom of the baking pan, then spoon the rice mixture into the tomatoes and cover the tops with shredded mozzarella cheese. Bake in a 400 degree oven for about 1/2 hour, or until the top is nicely browned. Ciao Chow Linda is also on Facebook and Instagram. 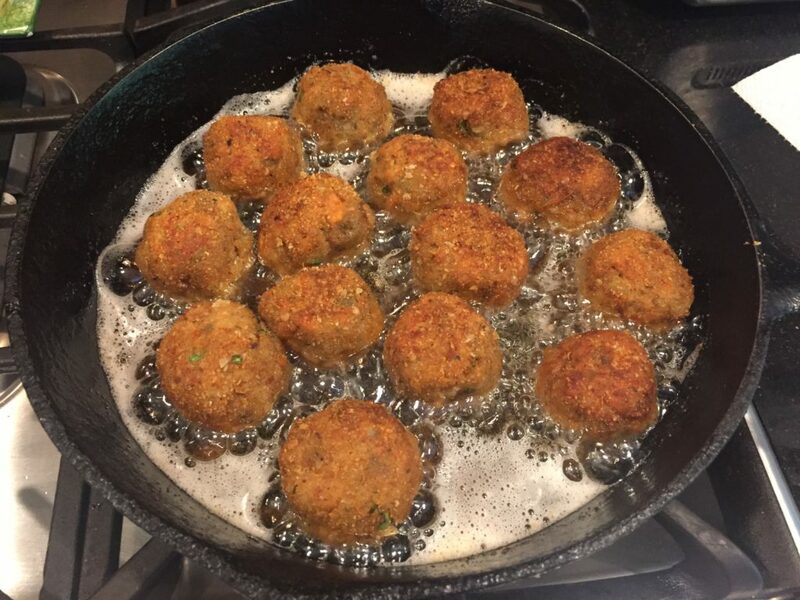 Click here to connect with me on Facebook and here for my Instagram page to see more of what I’m cooking up each day. 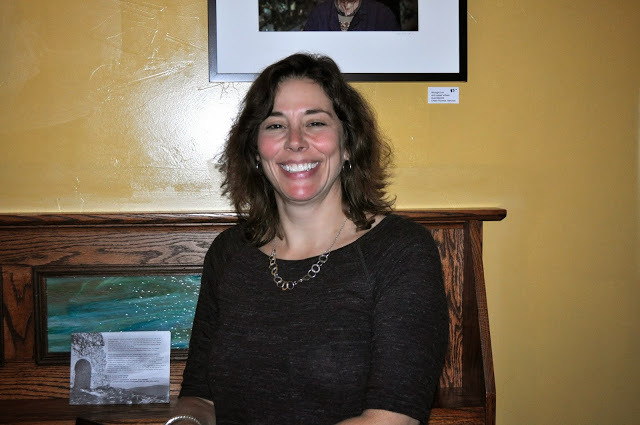 And if you live in the Central N.J. area, join me on Saturday, August 29 at 11 a.m. at the West Windsor Farmer’s Market, when I’ll be on a panel discussion with other food writers and photographers, including Rome-based Katie Parla and NJ Monthly columnist Pat Tanner. 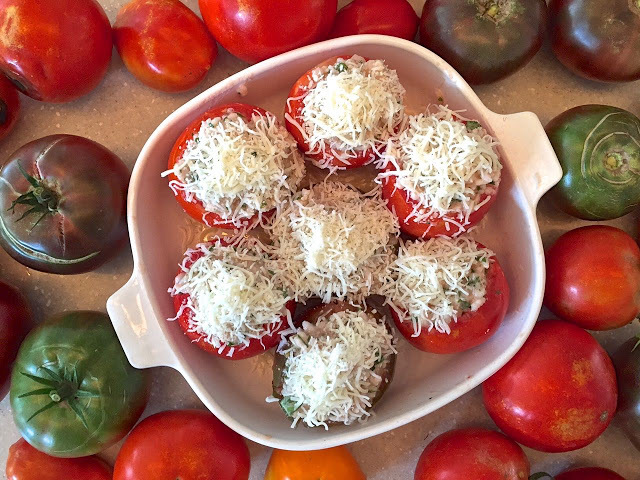 Heat the oven to 400 degrees F. Rub the bottom and sides of a baking dish just large enough to fit the tomatoes with olive oil. Boil the arborio rice in an uncovered pan on medium heat with the water, about 12 minutes. 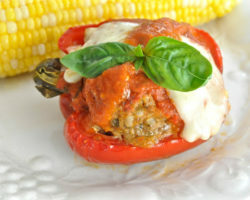 I like to slightly undercook it since it will cook further in the oven once inside the tomatoes. Nearly all the water should be absorbed by that time. Dump into a bowl. 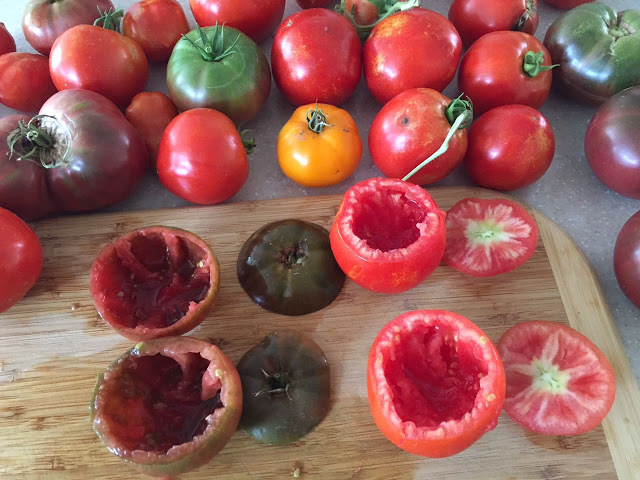 Slice the top off each tomato. Set a colander over a bowl and scoop out the insides of the tomatoes, leaving a wall about 1/4 inch thick. I used a small paring knife and spoon. Just be sure not to pierce through the tomato. 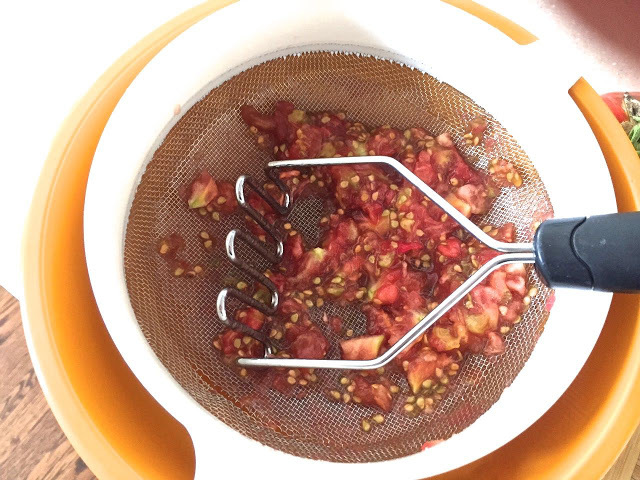 Set the tomatoes aside; press the pulp and seeds to extract as much tomato juice as possible into the bowl. 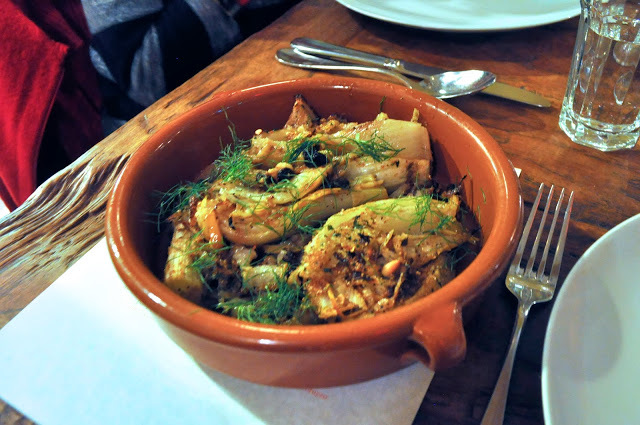 Discard the solids that remain in the colander. Combine the cooked rice with the juices from the tomatoes. Stir in the mozzarella and Parmigiano cheeses, along with the parsley, basil, and oregano. Season with a little salt and pepper. Pour in 1/4 cup olive oil and mix everything together well. Spoon the rice mixture into each tomato, filling to the top without overstuffing. Sprinkle a little extra shredded mozzarella on top. 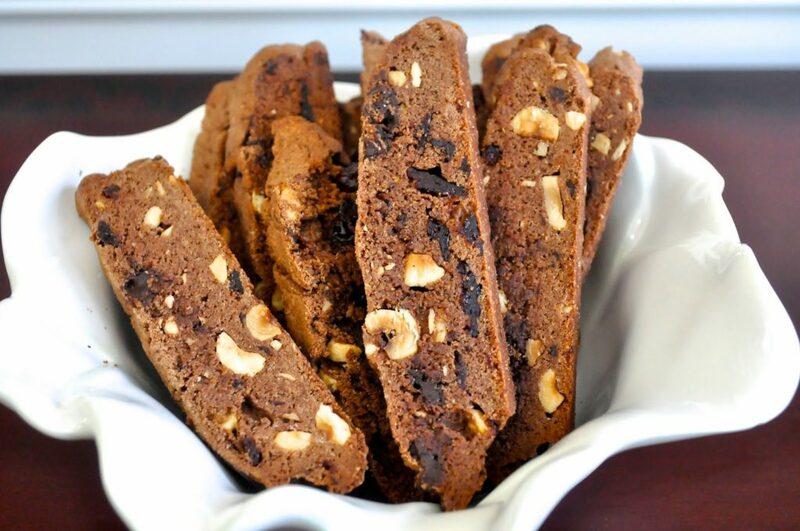 Update March 15, 2015: The winner of the giveaway book “Ciao Biscotti” is Carolyn Immordino MacCleod. 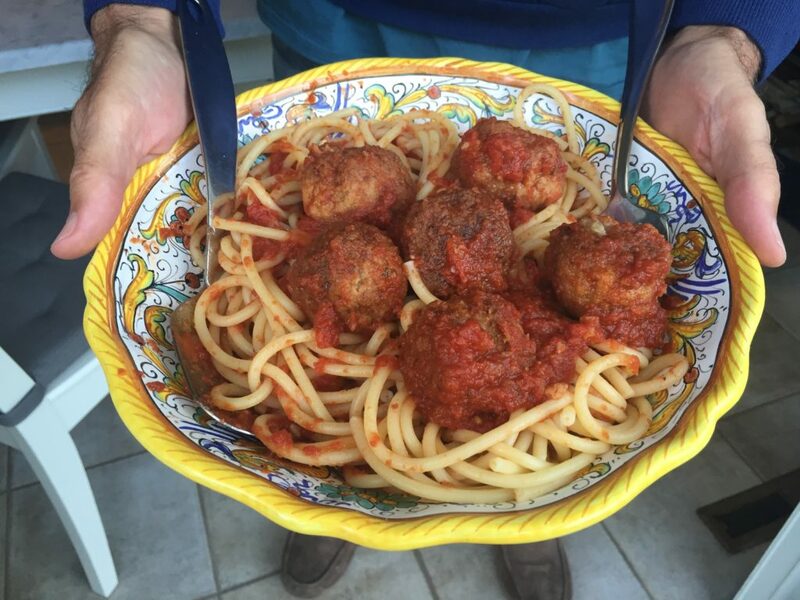 Anytime my friend Domenica Marchetti writes a new cookbook, you can be assured it’s going to be good. 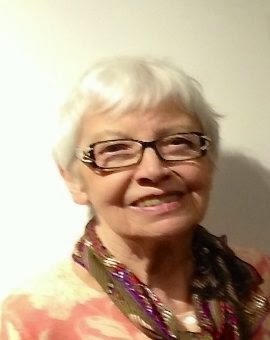 Long a champion of Italian cooking, especially that of the Abruzzo region, her cookbooks are well researched and well written, apropos for a woman who worked as a newspaper journalist before moving to culinary writing. She has now published a new book – “Ciao Biscotti” – that will keep biscotti lovers happy for a very long time. Some of the old classics are here, like almond or anise biscotti, but she’s also included some recipes for some not-so-traditional ones like browned butter and Toblerone, and cardamom-pecan. 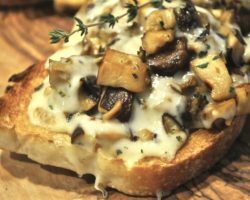 One chapter deals with the savory side of biscotti, such as crispy pancetta, or smoky gouda, giving you even more reason to uncork a nice bottle of wine and chill out with a biscotto or two. It’s hard choosing a favorite, because they’re all so delicious, but if you were to peek inside my cookie tins, you’d find that someone’s been dipping into the chocolate-dipped coconut ones with a little more gusto than she should have. I can’t wait to try some of the other recipes in the weeks ahead. 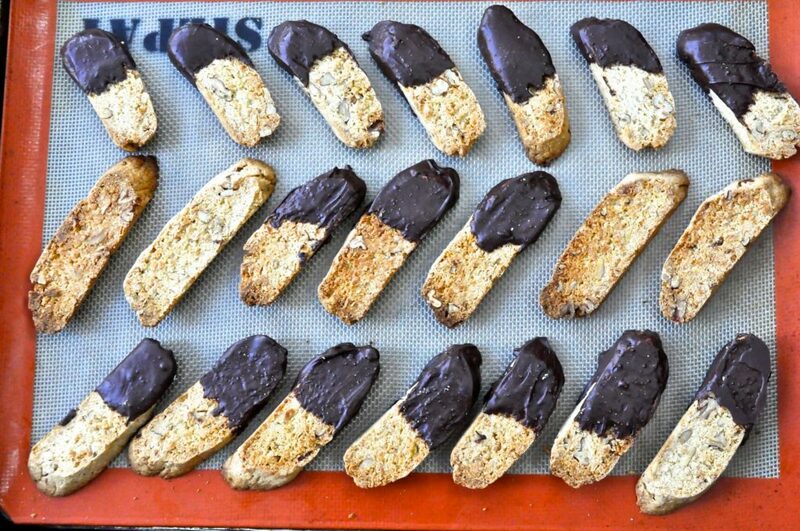 I’m including the recipe for the chocolate-covered coconut biscotti, but for others, you’ll just have to get the book. 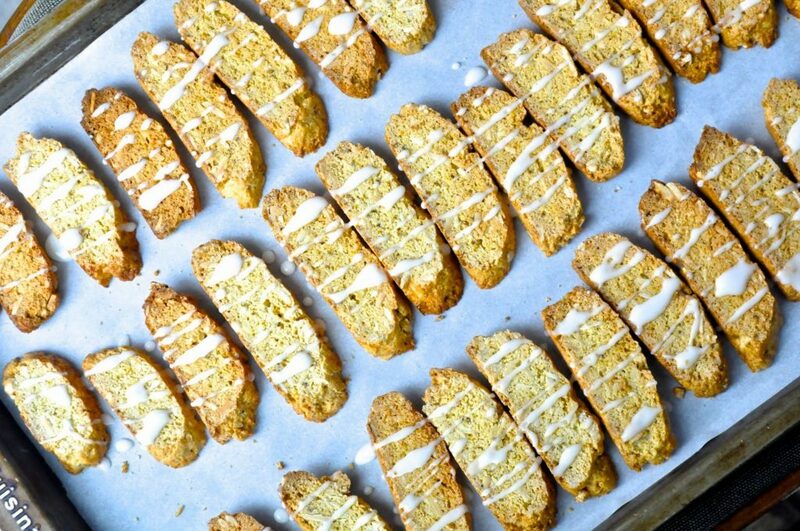 You won’t be disappointed, although I have a different experience in freezing biscotti than Domenica, maybe because when I bake them a second time, I do so at a higher temperature than she does. 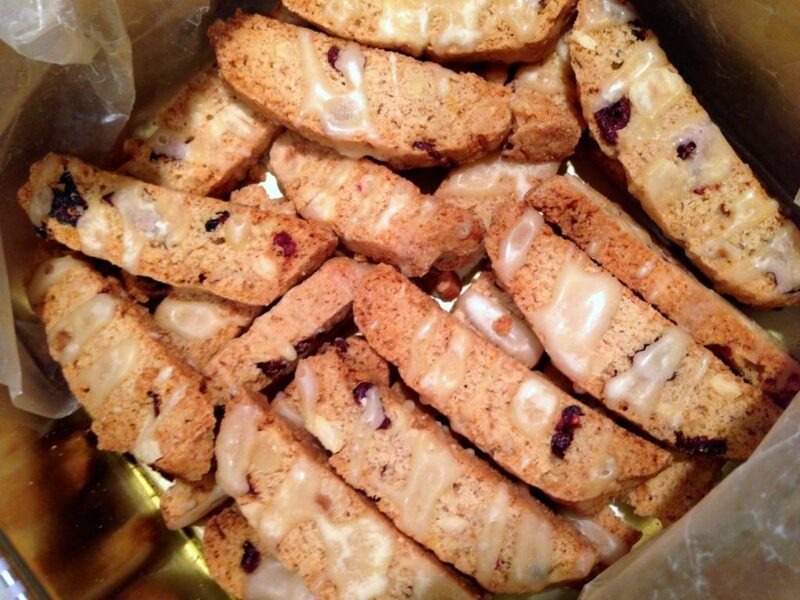 Let me add my nerd notes here: biscotti means twice baked, in case you didn’t already know. The prefix “bis” is used in several instances to indicate repetition of some sort or other. When you’re at the end of a performance in Italy and want the singer to perform one more song, you don’t yell “encore,” you yell “bis.” Also, while nonno is grandfather in Italian, bisnonno is a great grandfather, the same way that bisnipote is a great grandchild, or great nephew or niece. Which brings me back to the second baking and freezing. For the second baking, I do leave them in the oven longer and at a higher temperature than Domenica suggests in the book, because I like them to be uncompromisingly hard and crunchy. I crank up the temperature of the oven to 400 degrees and leave them in for another ten to fifteen minutes or so, flipping them over halfway, until they’re golden on each side, and checking continually to make sure they don’t burn. 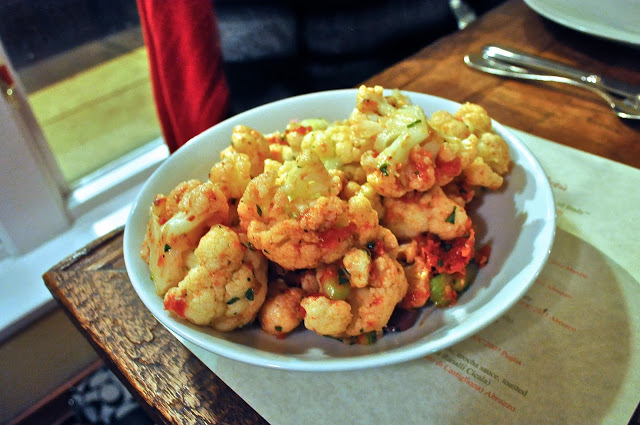 That dries out any remaining moisture and makes them as crunchy and addictive as eating potato chips. I find that the extra baking time and temperature means that they freeze well and never lose their crunch, even the frosted ones. 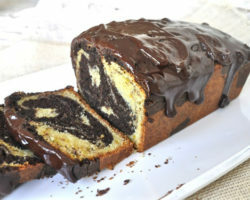 But first try baking according to Domenica’s directions and see if that works best for you. For those of you who live in the Philadelphia, Pa. area, Domenica will be at Fante’s fabulous kitchen store on 9th St., this Sat. March 7, from 11 a.m. to 2 p.m., so you can get a copy personally autographed by her. 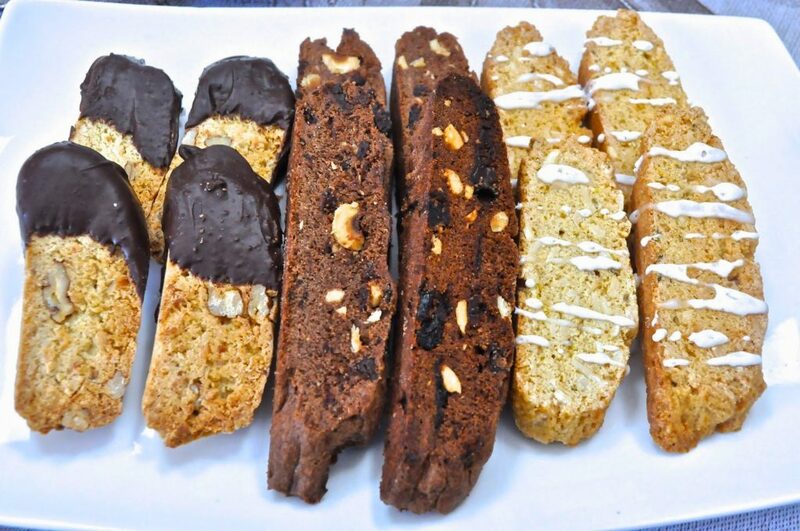 Free samples of biscotti too! But I’d also like to give one of my readers a chance to own a copy, so I’m offering a giveaway here. 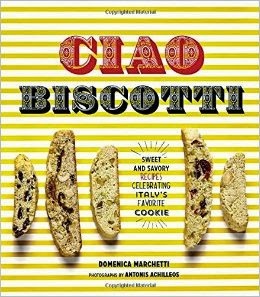 All you have to do to win a copy of “Ciao Biscotti” is to leave a comment below (on the blog NOT in email, for those of you who receive updates via email). 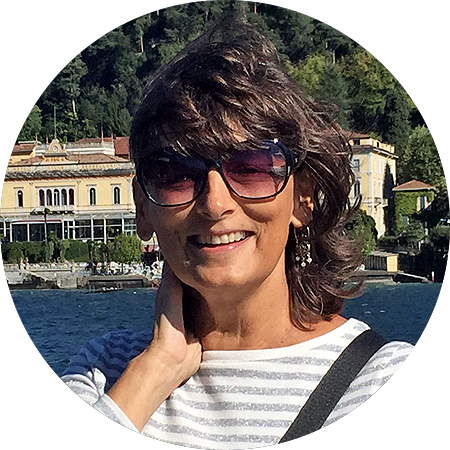 Domenica herself recently held a giveaway on her blog for a copy of the book and asked readers to leave a comment describing something sweet about Italy. 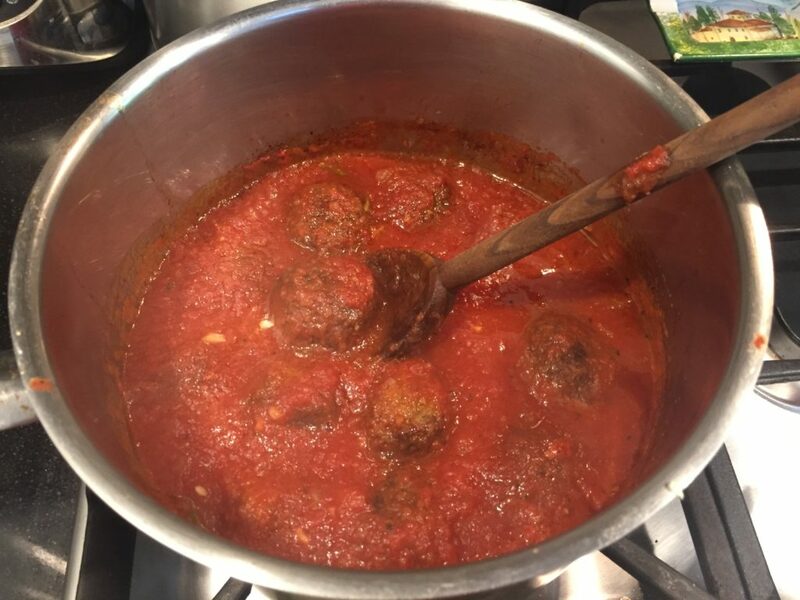 I loved reading some of the comments, whether it was about a sweet Italian food, or a sweet memory of Italy — so I’m asking my readers to do the same. 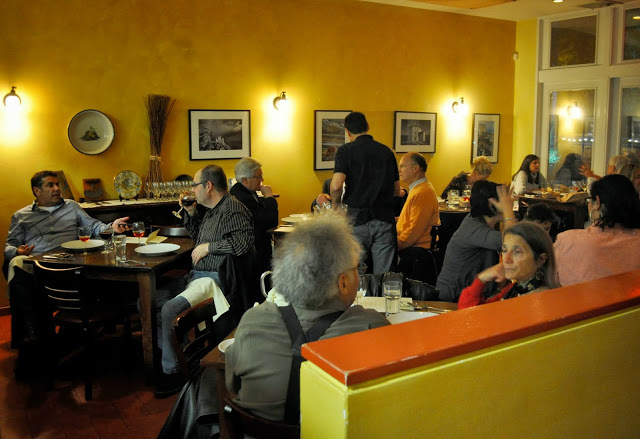 If you’ve never been to Italy, then describe what you love about Italian food, art or music. I’ll let the computer choose a winner with a randomly generated number. You don’t need to have a blog to enter, but if you don’t, please leave an email address so I can contact the winner. Grazie. Combine the flour, coconut, sugar, baking powder and salt in the bowl of a stand mixer fitted with the paddle attachment. Mix briefly on low speed. Add the almonds and mix briefly on low to combine. 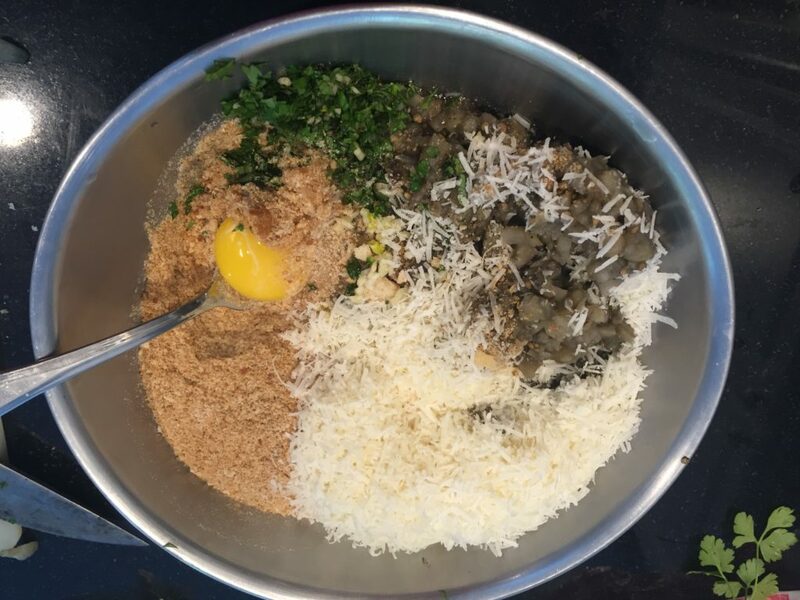 Add the butter in pieces and mix on medium low speed until the mixture looks like damp sand. Pour in the eggs and mix on medium speed until a soft, slightly sticky dough has formed. Turn the dough out onto a lightly floured work surface and pat it into a disk. Divide it in half. Lightly moisten your hands with water and gently roll one portion of dough into a rough oval. Place it lengthwise on one half of the baking sheet and use your hands and fingers to stretch and pat the dough into a log about 2 1/2 in/6 cm wide and 12 in/30 cm long. 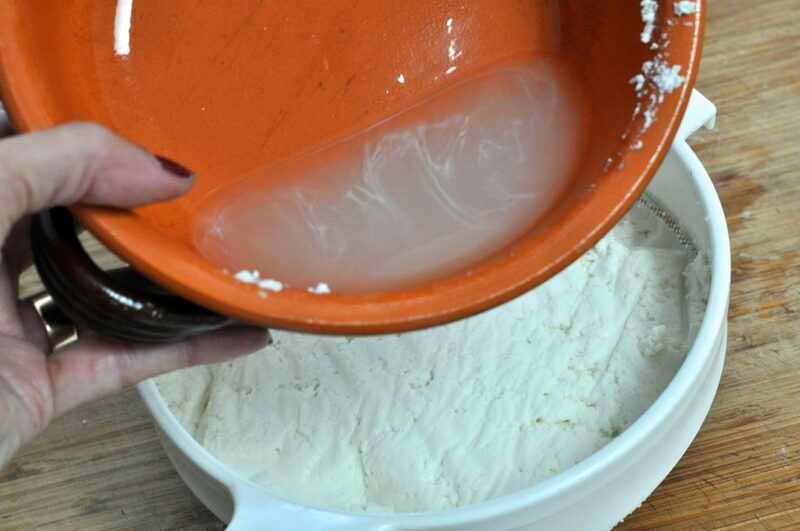 Shape the second piece of dough in the same way, moistening your hands as necessary. Press down on the logs to flatten them out a bit and make the tops oven. 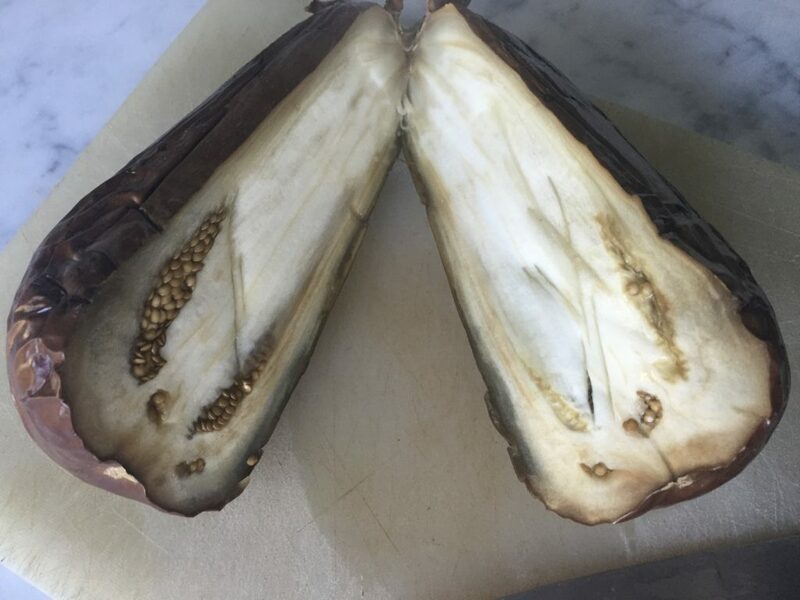 Transfer the cooled logs to a cutting board and, using a Santoku knife or a serrated bread knife, cut them on the diagonal into 1/2 in/12 mm-thick slices. Arrange the slices, cut-side up, on the baking sheet (in batches if necessary) and bake for 10 minutes. Turn the slices over and bake for another 10 to 15 minutes, until they are crisp and golden. Transfer the slices to the rack to cool completely. Arrange the slices cut-side up on a baking sheet lined with wax paper. Dip one end of each biscotto into the melted chocolate and set them on the wax paper. 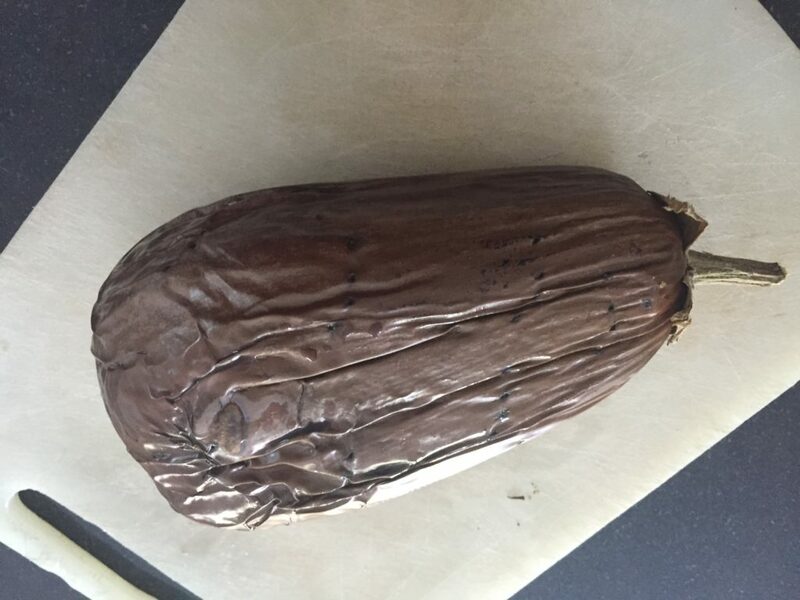 Place the baking sheet in the refrigerator for 30 minutes, or until the chocolate is set. 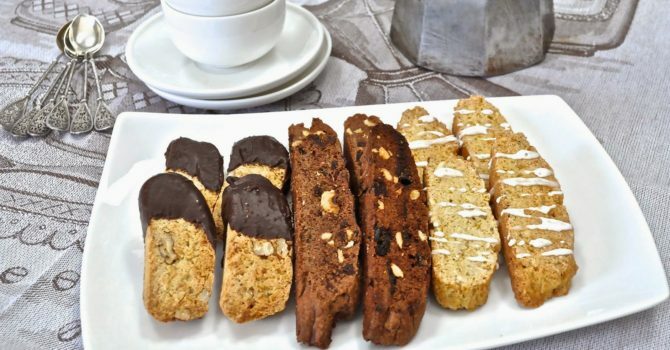 Let the biscotti return to room temperature before serving. Over the years, I’ve whittled my Christmas cookie baking to two or three types. Fortunately, I know I can count on my father’s wife to bring me a tin of pizzelle and my friend Lilli to bake me some of her almond paste cookies. 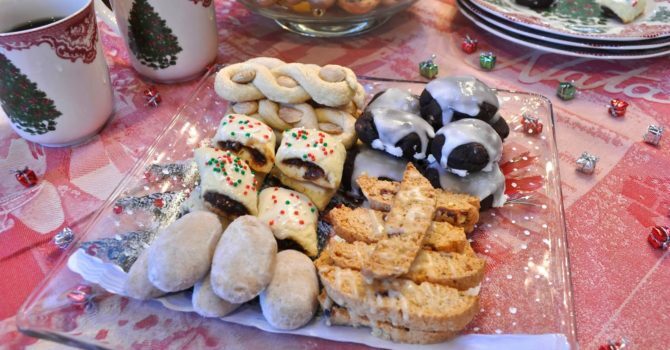 But this year, I can add three more types of cookies to my cookie tray, thanks to a cookie exchange with three of my favorite Italian food bloggers, – Adri, Domenica and Marie. 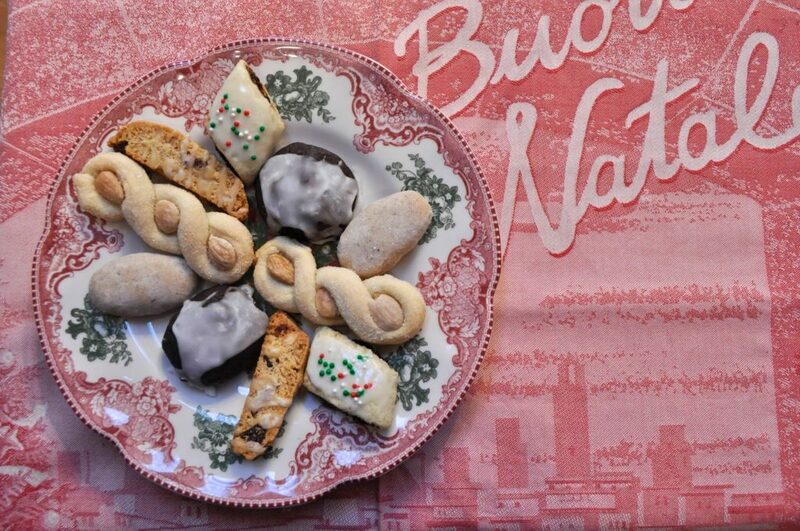 We started our first annual “Italian Gals Cookie Exchange,” baking cookies and shipping them to each other at our homes across the United States – from California and Illinois to Virginia and New Jersey. 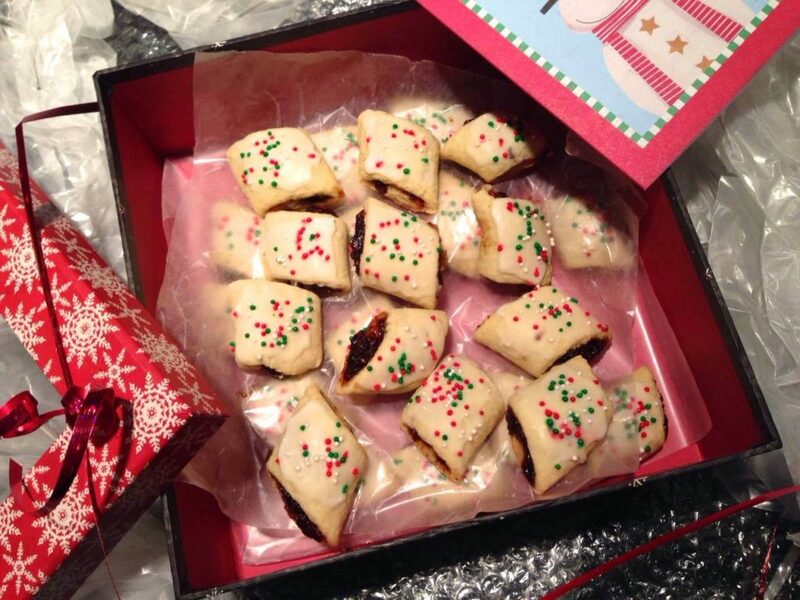 Who says you have to live in the same town to have a cookie exchange? Adri’s heavenly three-nut fingers came in a tin beautifully lined in striped tissue paper, with each pair of cookies individually delicately wrapped inside its own waxed paper envelope. 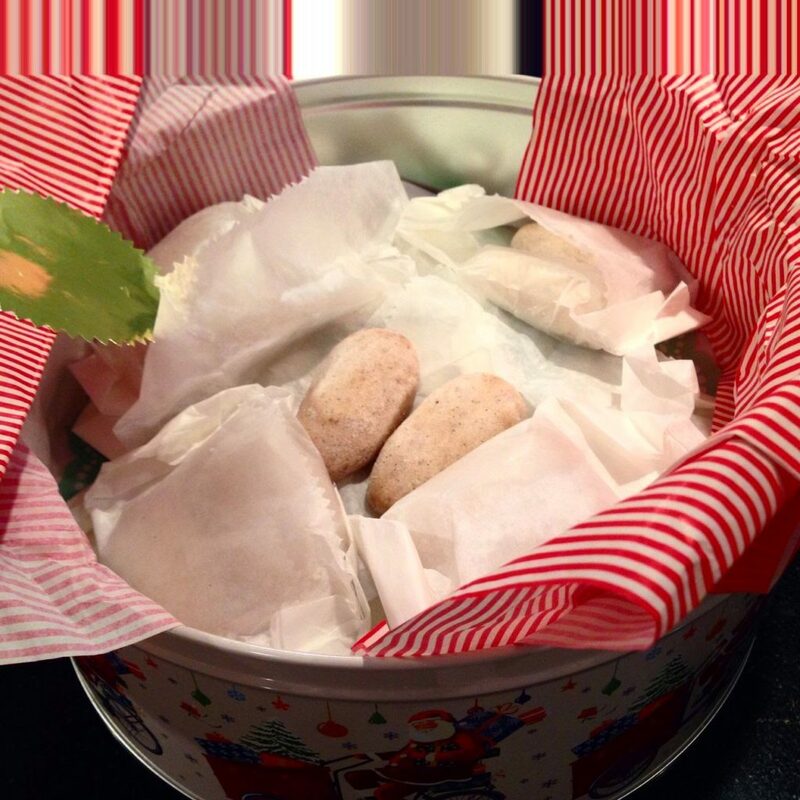 The buttery cookies, with almonds, hazelnuts and pecans, just melted in the mouth. And the reputation for Marie’s legendary cucidati preceded the actual cookies. I’ve been reading about them for years, since she makes hundreds of them each Christmas and I’ve been so anxious to try them. 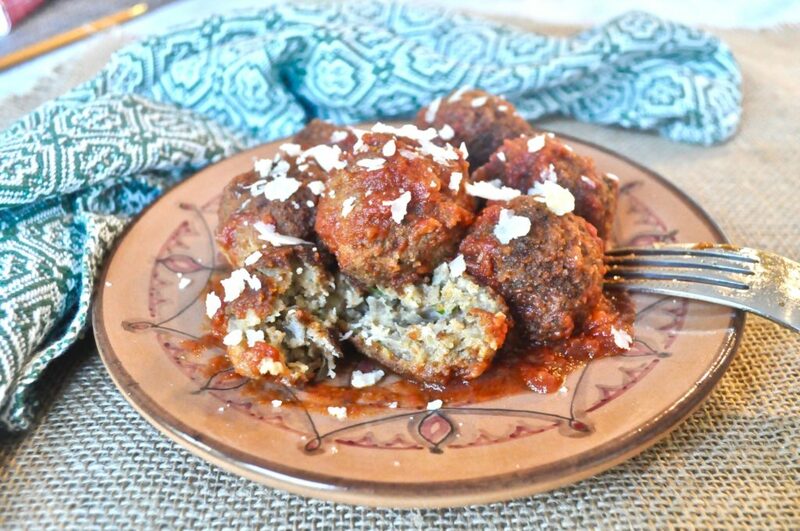 They were every bit as delicious as what I had expected and brought back memories of Christmases with my late husband’s Aunt Jenny, who baked a similar version. 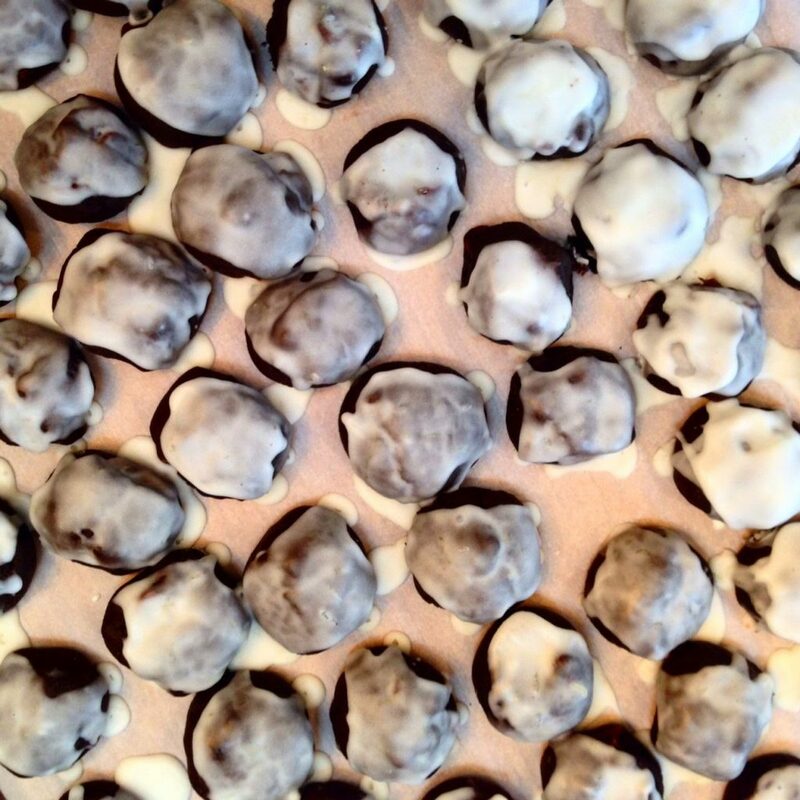 My contribution were these chocolate-y, spicy cookies that my mother made each Christmas when I was growing up. She called them “brownies” but they’re nothing like American brownies, except for the chocolate. In addition to the cinnamon, nutmeg and cloves, there’s another unexpected spice that gives them a zing. For me, they’re a taste of my childhood and it wouldn’t be Christmas without them. 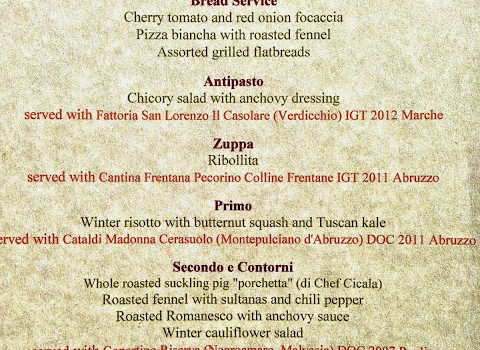 The recipe, adapted from Alfred Portale, is listed below, but you can see step by step photos of how to make them on a post I wrote here, shortly after I started the blog in 2008. They’re actually based on a Sicilian cookie called either “tutu” or “toto,” according to reports I received from readers. 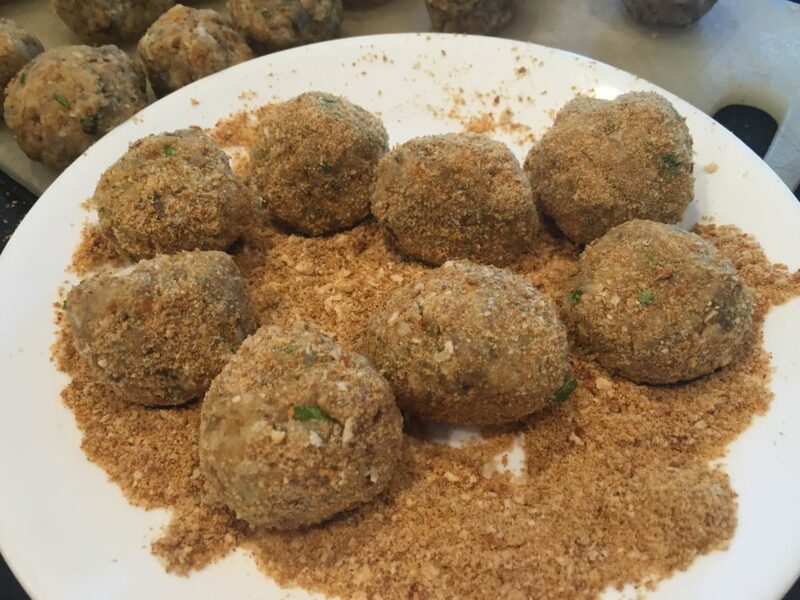 Sometimes they’re even referred to as “Meatball cookies.” I think you can see why. Also included on the plate below are a couple of “intorchiate,” a cookie I wrote about in my last blog post. I hope we four bloggers continue to maintain this tradition each year, and that we have inspired you to start your own cookie exchange, whether you live close to your friends, or far away. Just make sure to bake cookies that aren’t too fragile so they won’t break during shipment, and to keep it to a maximum of two dozen cookies and four people. 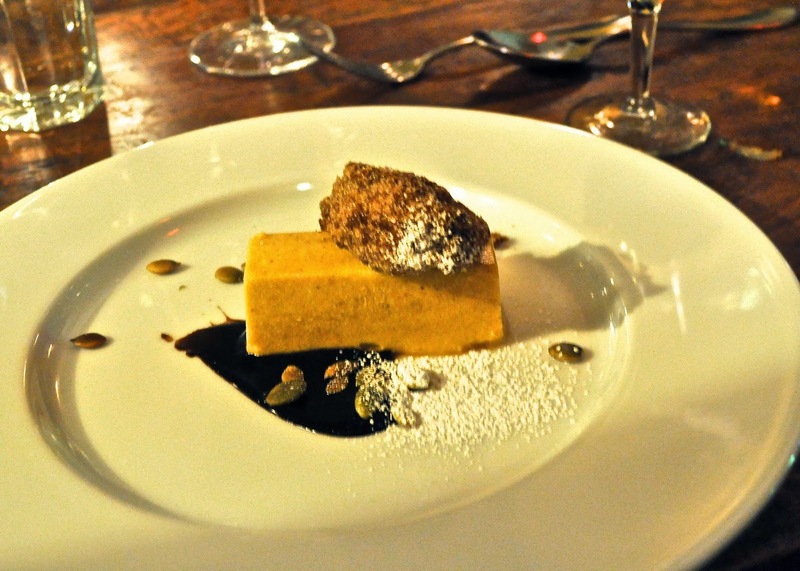 Otherwise, you’ll spend a lot on shipping and you’ll be baking until la Befana comes home on January 6. In the meantime, Buon Natale and best wishes for a wonderful 2015 to all my readers. Thank you for taking the time to read my blog through the year and for those of you who leave comments, an extra bacione. 2. With a heavy duty mixer, beat butter and sugar together until creamy. Add eggs, one at a time, beating on medium speed for 1 minute after each addition. Beat in vanilla, jam, and milk. Set mixer to low and gradually add flour mixture, beating only until it is incorporated. Add the chocolate chips. The batter will be extremely stiff. “It’s spring! It’s spring!” Babar, the king of the elephants says one sunny day he opens his window and sees that the leaves and flowers seem to have opened overnight. 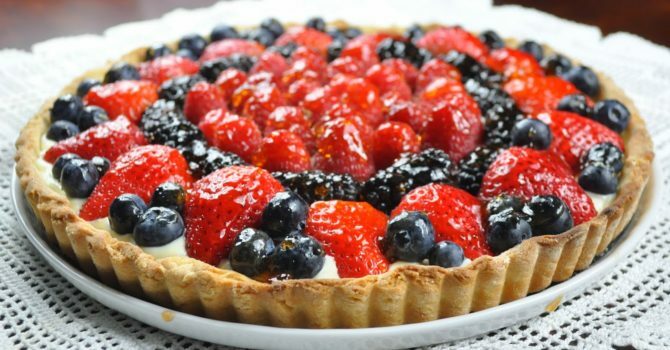 Don’t ask me why that line stands out to me, (maybe because I read it hundreds of times to my kids), but that’s what I think of when I see this tart. It’s as pretty as a fine spring day, and tastes equally delicious too, with its luscious lemony filling. 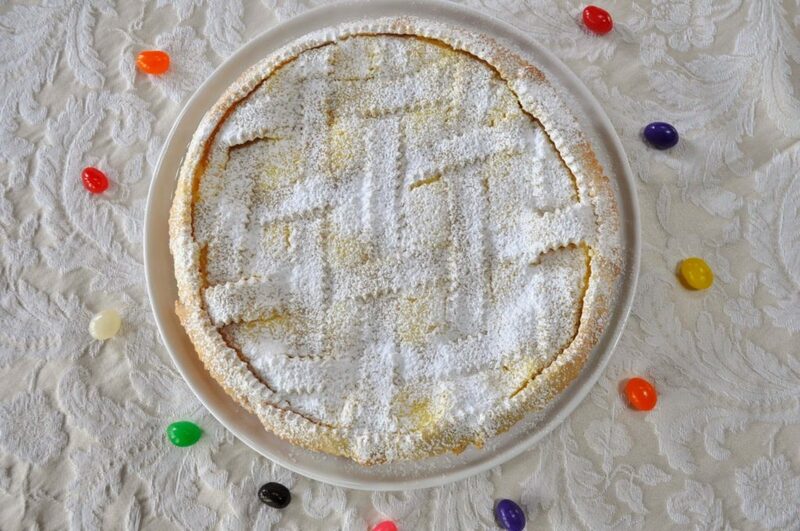 The crust is really special too – it’s the same one I used for the ricotta tart I made for Easter from Domenica Marchetti. But I blind-baked it first this time, then added the filling. 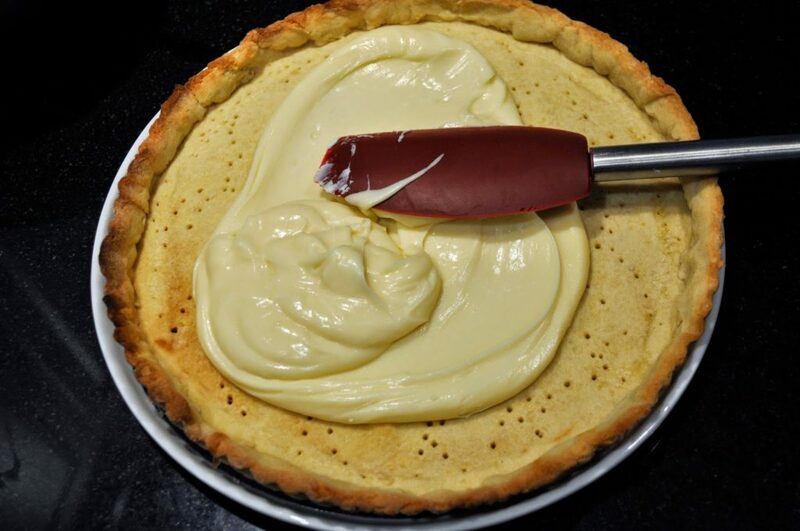 After you’ve placed the dough into the tart pan, use a fork to prick it all around. Spray one side of aluminum foil with Pam, or butter it lightly, then press it down over the dough and add some beans or rice to keep the dough from puffing up during the baking. Remove it from the oven and let it cool completely before adding the filling. (Hint – if you want to take the easy way out – go buy a pie crust all ready for the oven. I won’t tell. But Domenica’s crust recipe is so much better than anything store bought.) The filling is a snap to make, since all you do is open a jar of lemon curd and mix some of it with mascarpone cheese. 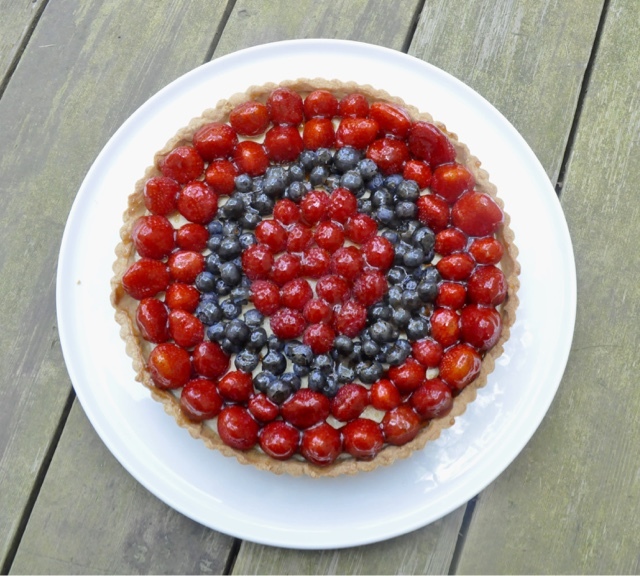 Now comes the fun part – arranging the berries in a pretty design. 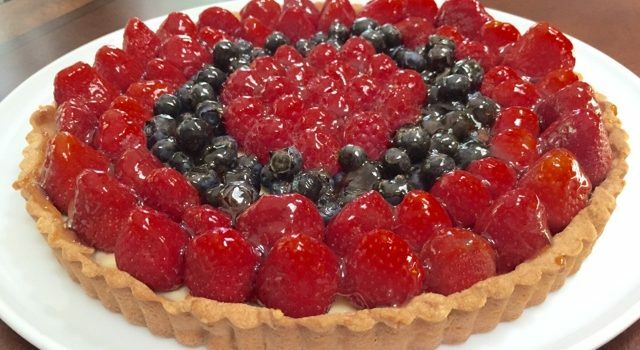 Spread some clear or light colored jelly over the berries and chill before serving. 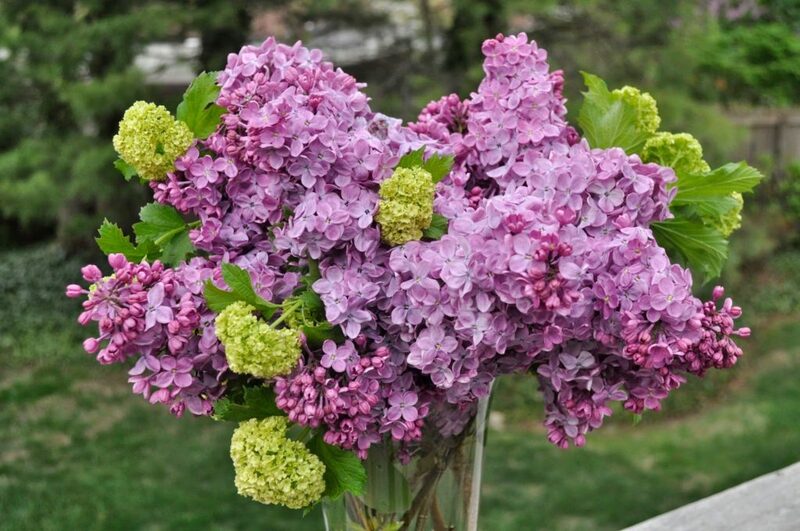 And don’t forget to open the windows to enjoy the spring flowers that seem to have opened overnight. Note: This makes a lot of dough – enough for two tarts. Or make one large one and several small ones, or one large tart and use the rest to make delicious cookies that taste like shortbread. Heat the oven to 400 degrees F. I “blind-bake” the crust by buttering some aluminum foil and pressing that lightly over the raw dough. Then add some beans or rice to weigh it down. 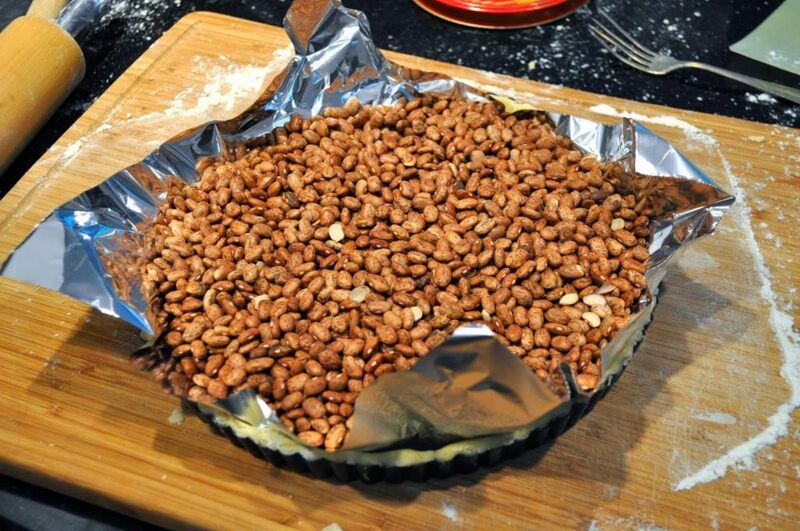 Bake for about 10 minutes, then remove the foil and beans and bake for another 10 minutes or until lightly golden. Remove from oven and let it cool completely before adding the filling. Blend the mascarpone and lemon curd together with a whisk. Spread it over the baked tart crust. 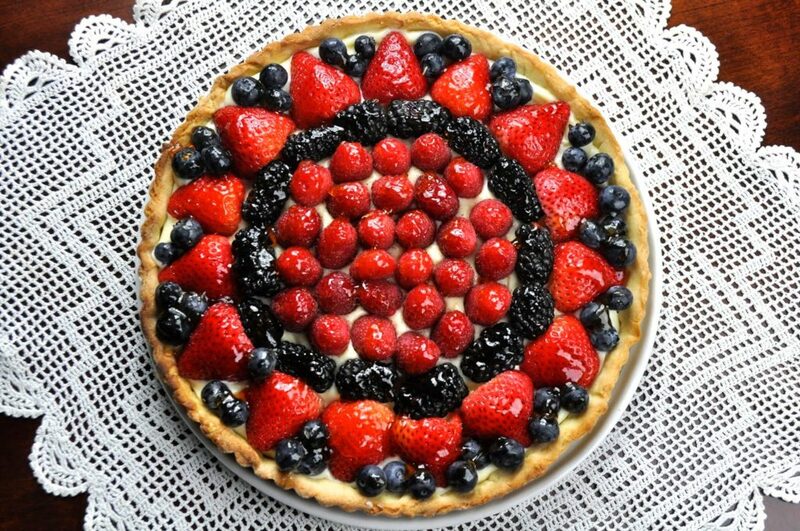 Top with berries (I used a combination of raspberries, blackberries, strawberries and blueberries), arranged in a pretty design. Spread a light colored jelly or jam over the top. I used homemade quince jelly, but apricot or apple or orange would be fine too. Warm it in the microwave first to loosen the jelly a bit so you’ll be able to spread it better. 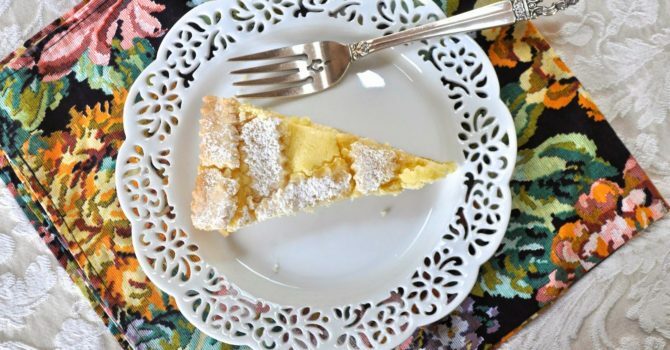 Domenica Marchetti’s Lemon Ricotta Crostata and Cookies too. For this crostata though, I first drained the ricotta. 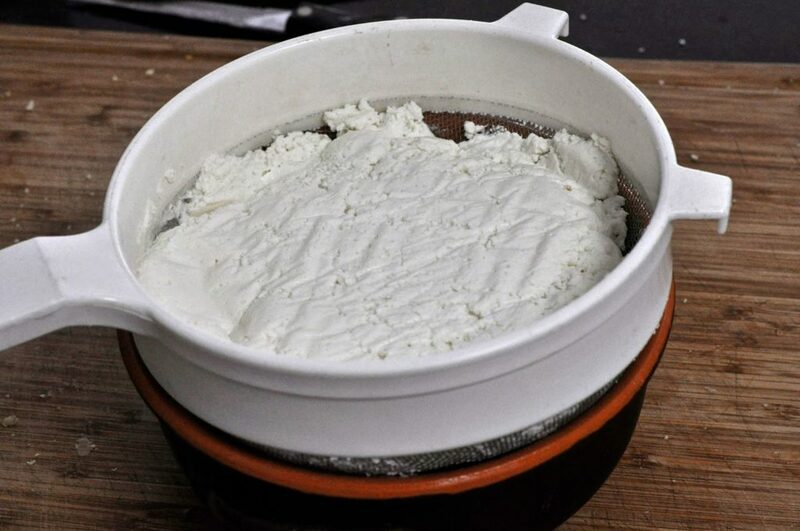 Try to find freshly made ricotta if possible, rather than a supermarket brand. 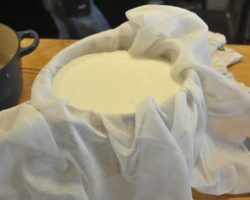 I place a coffee filter in a colander, add the ricotta, then cover the top with plastic wrap and put a weight over it (something like a heavy can). I let it drain overnight in the refrigerator, but if you’re pressed for time, even a few hours will help. At least one cup of liquid came out – that would be liquid that would otherwise give you a soggy crust. The mascarpone in the recipe adds a creaminess that ordinary ricotta tarts don’t have. The dough is really easy to work, so the lattice strips don’t fall apart as in other recipes I’ve used. There’s not a lot of sugar in the filling, so a dusting of powdered sugar over the top adds a nice touch of sweetness. And it will cover up any cracks that may appear in your lattice work. Remember those leftover dough scraps I mentioned? 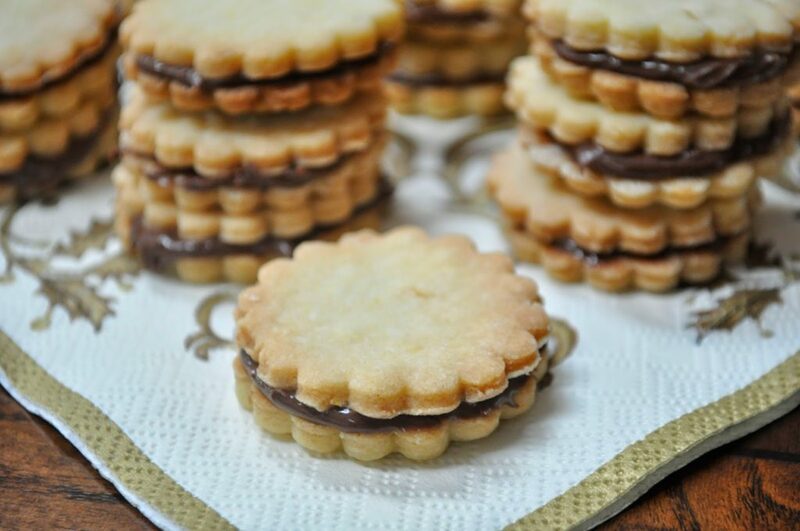 Domenica suggests you make cookies with them and sandwich them together with a bit of Nutella. Ottima idea Domenica! Next time I may vary the filling and use some dulce de leche or homemade jam as well. But these Nutella ones were a bit hit and disappeared in no time. I have another batch all ready to go, to share with students in a class tomorrow. Remove the chilled dough from the refrigerator and cut it into 2 portions, one slightly larger than the other. Rewrap the smaller portion and return it to the refrigerator. On a lightly floured surface, roll out the large portion into an 11-inch circle about 1/8 inch thick or slightly thicker. 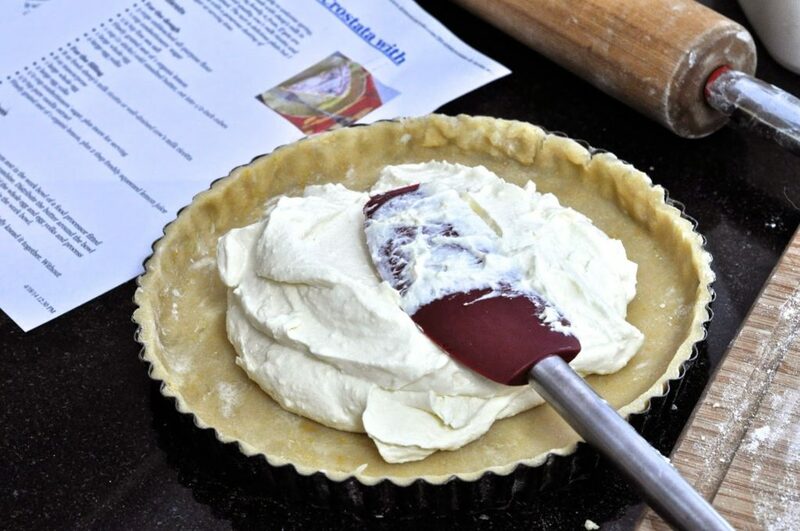 Carefully wrap the dough around the rolling pin and drape it over a 9-inch fluted tart pan with a removable bottom. Gently press the dough into the bottom and up the sides of the pan. Use the rolling pin or the flat of your hand to press around the perimeter of the pan to cut off any excess dough. 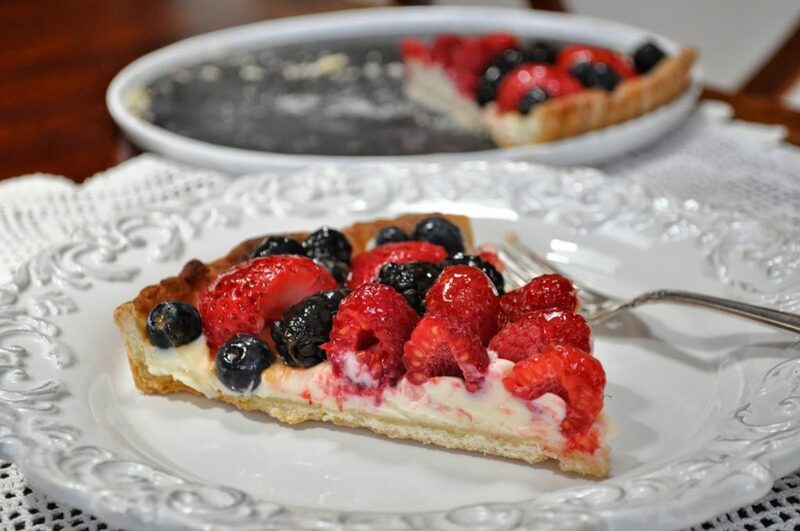 Put the lined tart pan in the refrigerator to chill for 30 minutes. In a large bowl, combine the ricotta, mascarpone, whole egg and yolks, sugar, vanilla and lemon juice and zest. Using a stand mixer or a handheld beater, beat the ingredients on high speed for about 1 minute, or until thoroughly combined and fluffy. 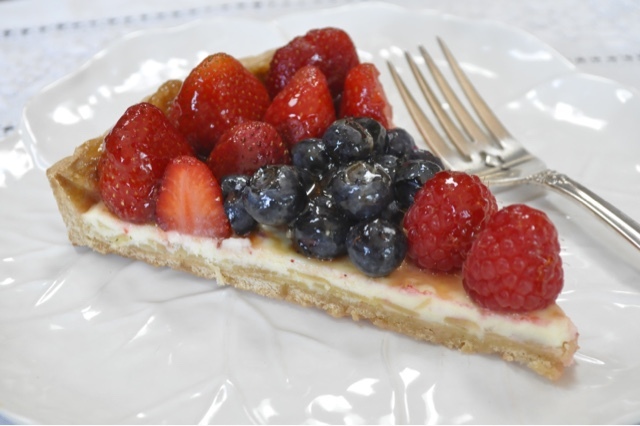 Remove the tart shell from the refrigerator. Scrape the filling into the shell and smooth it with a silicone spatula. Roll out the reserved piece of dough into a 10-inch round about 1/8 inch thick or slightly thicker, and cut it into 3/4-inch-wide strips with a fluted pastry wheel. 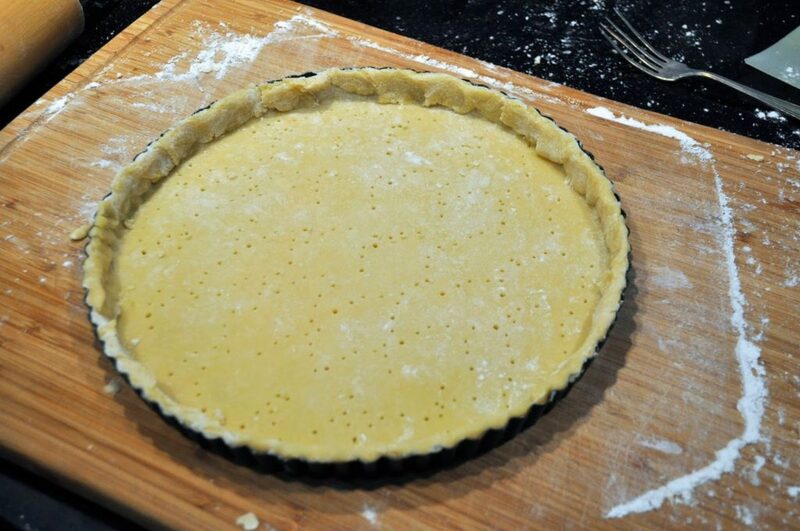 Carefully place the strips over the filled tart shell in a lattice pattern, gently pressing the ends of the strips into the sides of the tart shell. 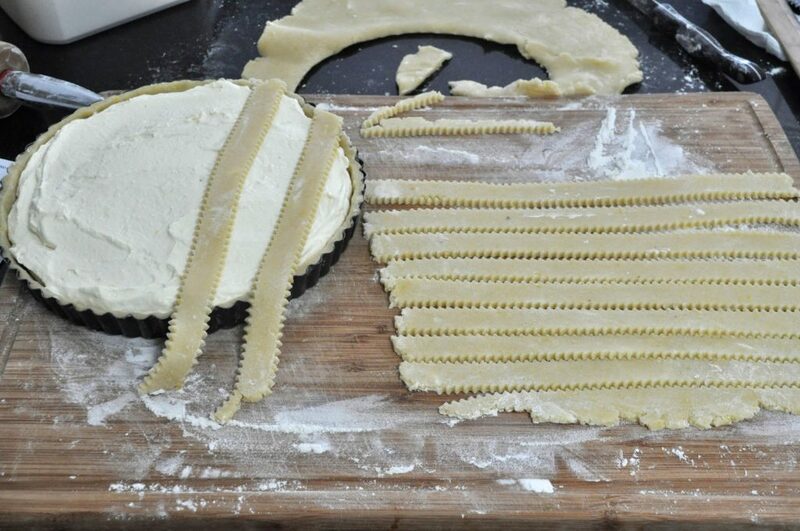 Use any remaining strips to form a rim around the perimiter of the crostata. NOTES This recipe will leave you with four leftover egg whites. Don’t toss them! Use them to make these meringue cookies. You will also likely have leftover dough. 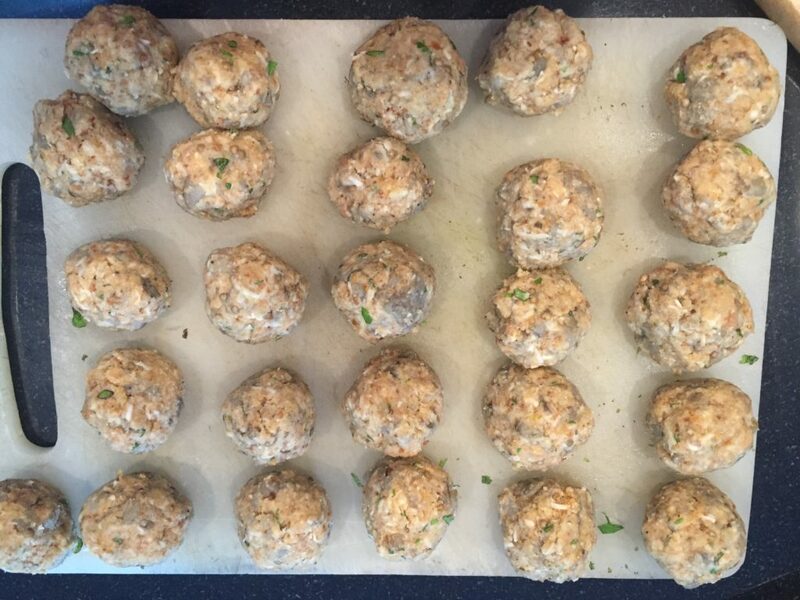 Gather the scraps into a ball, wrap and chill. 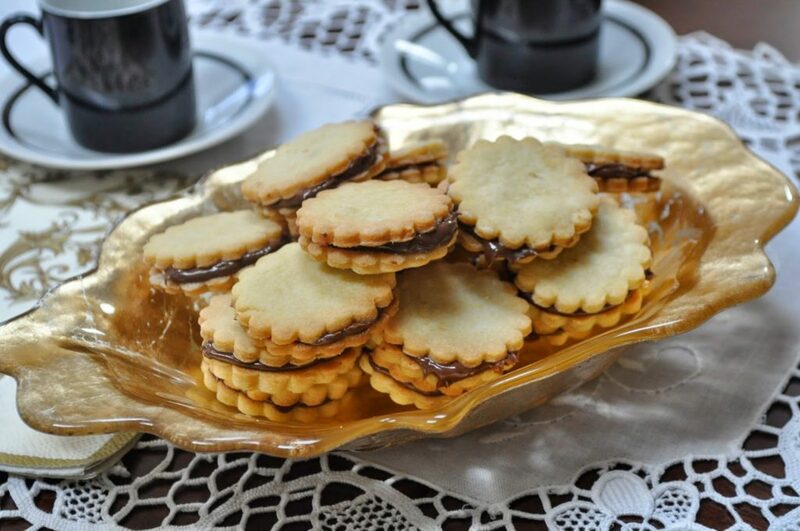 Then use the dough to make these nutella sandwich cookies.If you don’t plan to serve the crostata within a couple of hours of baking, cover with foil and store it in the refrigerator. Let it come back to room temperature before serving (although it’s also really good cold). 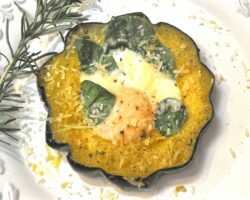 I love all of Domenica’s cookbooks, including her latest, “The Glorious Vegetables of Italy,” so deciding on a recipe for dinner wasn’t easy. 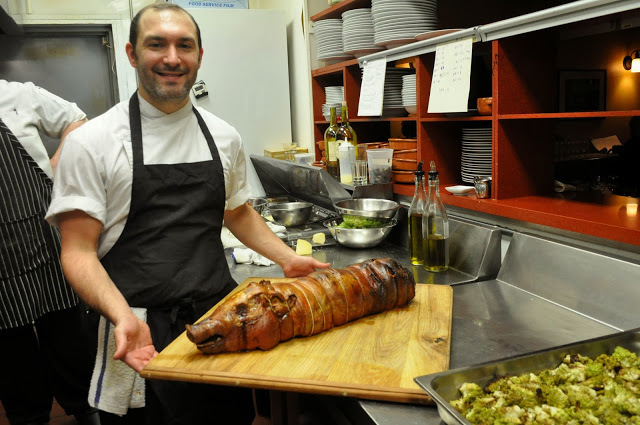 This one comes from Domenica’s mother Gabriella, a delightful woman who contributed much to Domenica’s love of cooking and the food of Abruzzo in particular. 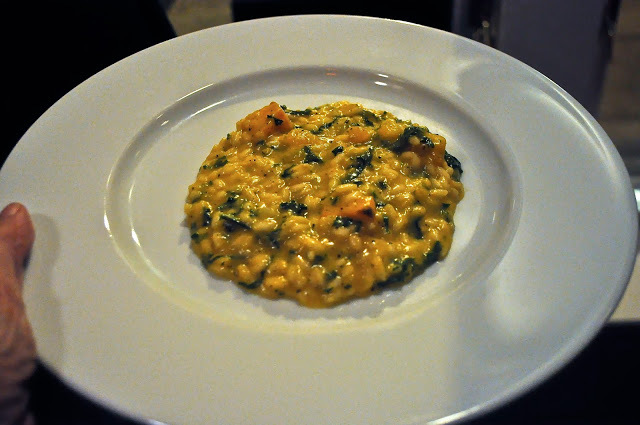 It’s a recipe that evokes Domenica’s childhood and turned the humble dish into a special occasion meal. Last night, as snow fell and the landscape turned white, I decided I needed a special occasion meal too. I hadn’t made a pot roast in years and picked up this large chuck roast at the supermarket earlier in the day. 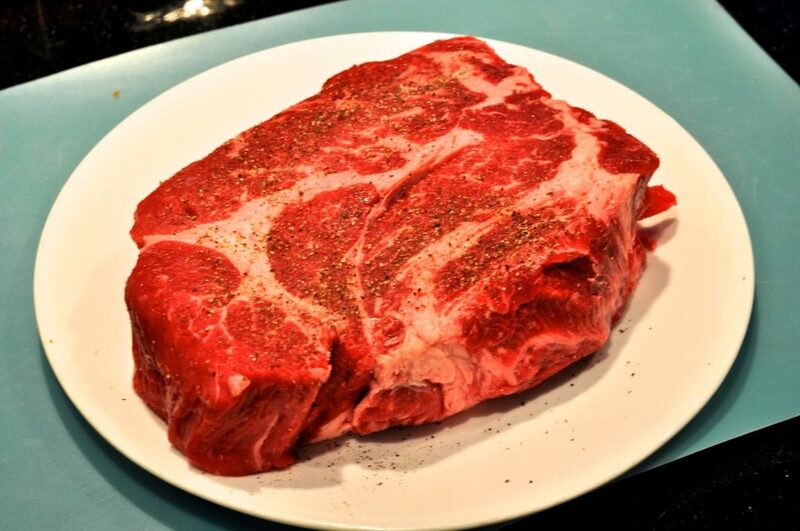 If you buy a piece with heavy veins of fat, as this one, you could carve some of it out before cooking, or do as I did and skim the fat from the liquid once it finishes cooking. 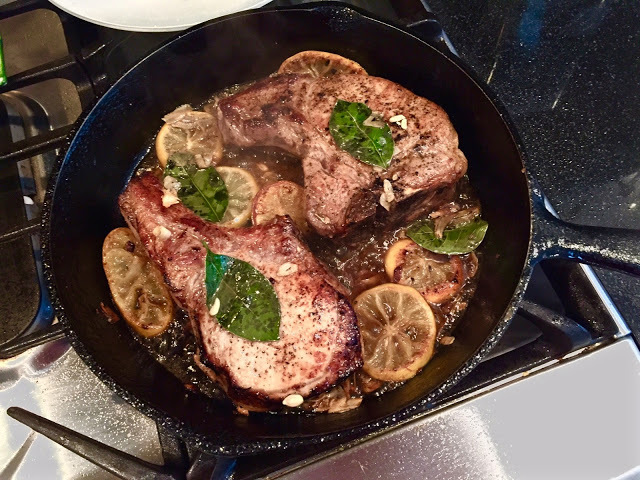 Season the meat with salt and pepper, then sear it on all sides, a process that takes four to five minutes. The vegetables (celery, onion, garlic, carrots, tomatoes) and seasonings are added to the pot, along with some wine and broth, then the oven does the work for the next two and a half hours. 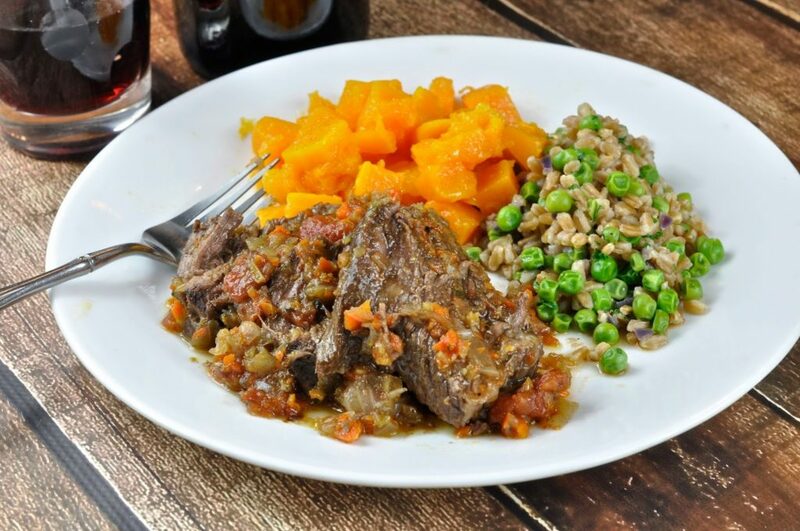 What emerges is a flavorful, cut-it-with-a-fork tender pot roast that will leave you wishing for even more snowy days when you can hunker indoors with a hearty meal. 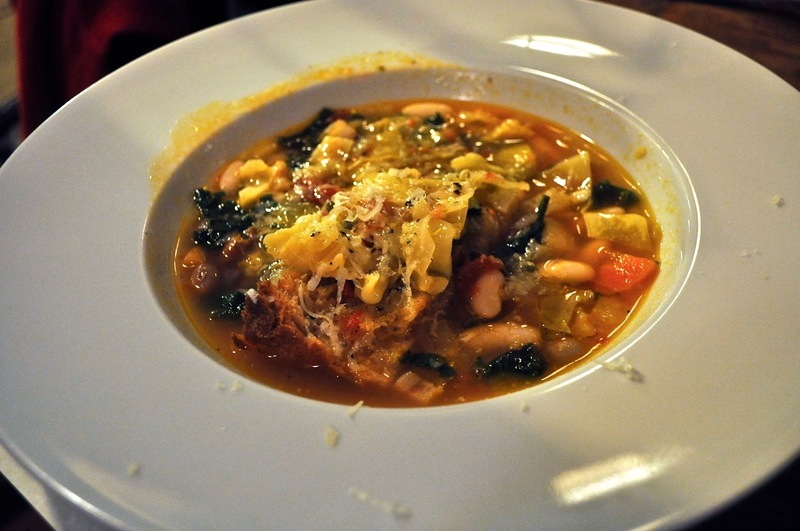 Serve with mashed potatoes, noodles, polenta or whatever starch you prefer. My side dishes were farro with peas, and steamed butternut squash. 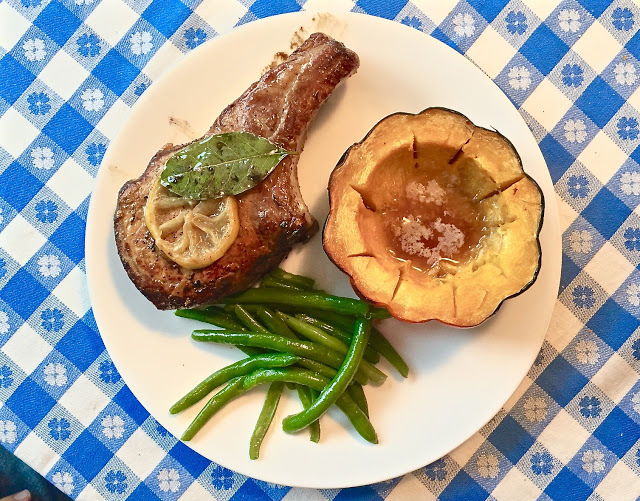 The sauce from the roast is still quite chunky, but you could puree it with a stick blender if you prefer a smoother version. 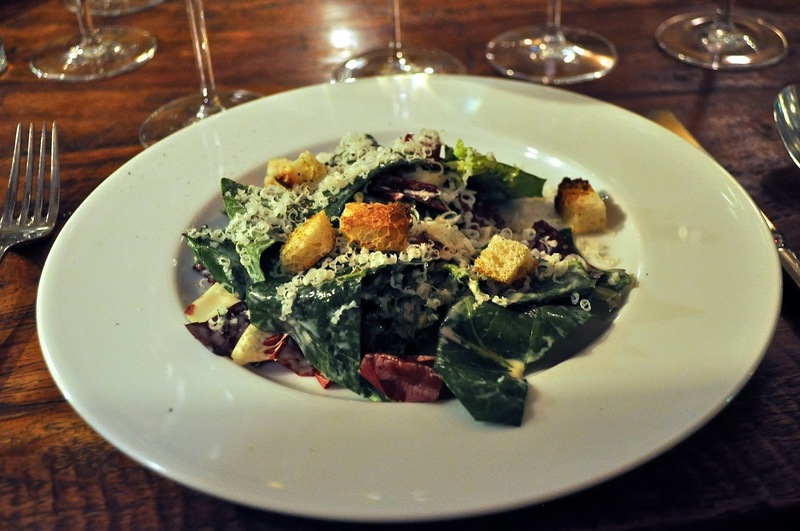 Consider setting some aside and adding it to some freshly cooked pasta as a first course. Heat the oven to 325 degrees F. Season the chuck roast with salt and pepper. In ad Dutch oven or other heavy-bottomed pot with a lid, heat the olive oil and butter over medium-high heat. 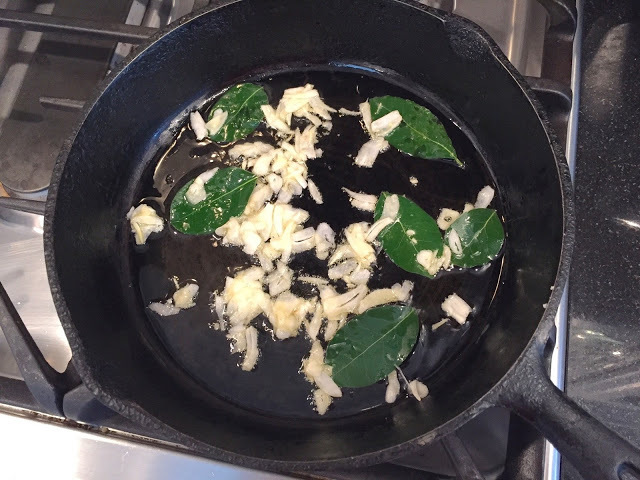 When the butter has melted and begins to sizzle place the roast in the pot. Brown it on all sides, turning it every 3 to 4 minutes, for even coloring. Using tongs, transfer the meat to a plate. Reduce the heat to medium, add the onion, garlic, carrot, and celery and saute, stirring frequently, for about 10 minutes, or until the vegetables are tender and the onion is pale gold but not browned. Stir in the thyme, followed by the wine, tomatoes, and the broth. 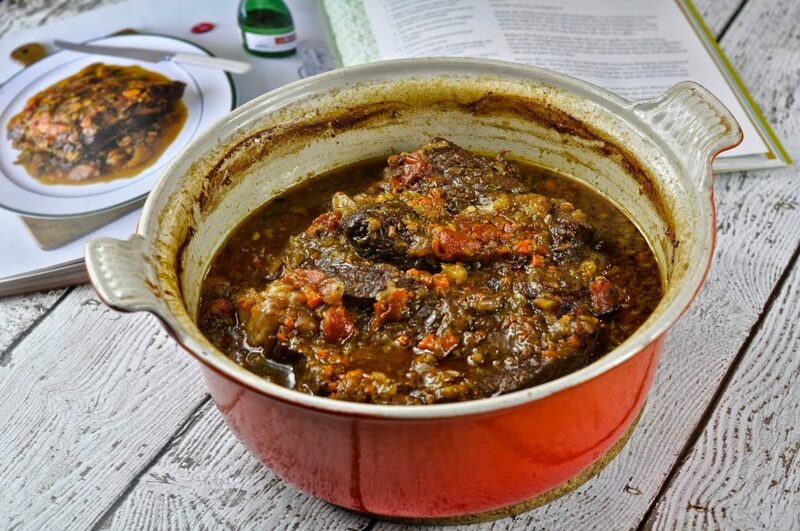 Return the meat to the pot along with any juices that have accumulated on the plate. 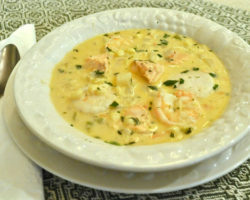 Bring the mixture to a simmer, cover, and place in the oven. 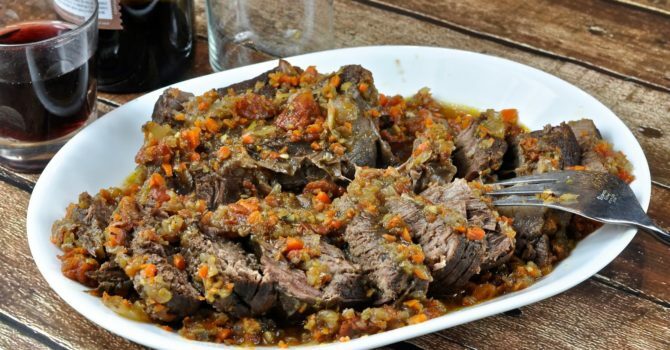 Let the pot roast braise, turning the meat every 30 minutes, for about 2 1/2 hours or until it is fork tender and the sauce is deliciously thick and red-brown. 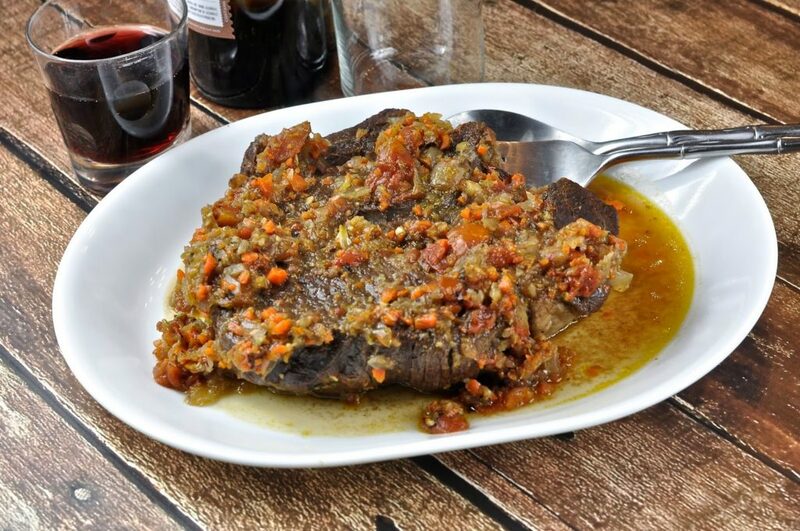 Remove the meat from the sauce and either cut it into thin slices or large chunks. Arrange the meat on a serving platter and spoon the sauce on top.